With over 200 types of casting on in knitting how do you choose the right cast on for your projects? Well, the knitted cast on is a good basic "go-to" cast on that you'll want to learn and use often. It provides an attractive and flexible cast-on that will stretch and bounce back into place. 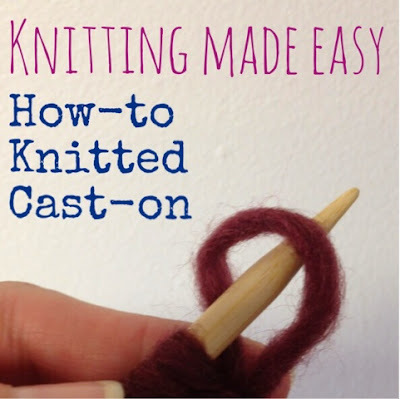 Learn the knitted cast on below in just 4 easy steps! Leaving a 4-5" tail, make a slipknot. Step 1: Insert the right hand needle into the slipknot going behind the left hand needle. Step 2: Wrap the yarn as if to knit (counter clockwise) around the right needle. Step 3: Draw thru your loop to create a stitch, but do not slip the stitch off the needle. Step 4: Take the loop that you have drawn out and pop it back onto the left hand needle and voila! You have made a stitch. Repeat Steps 1-4 until you have the total number of stitches needed for cast-on. Knitting Doctor Tip: Stay loose! As you cast-on stitches keep these stitches a little loose so it will be easier to work the first round.